If you’ve been a user of electronic chess databases for more than a decade I don’t need to tell you of the huge proliferation of chess data which has occurred during that time. When I got my start with ChessBase (back in 1992), a huge “master” database contained less than a quarter-million games. Today’s Mega Database 2011 contains nearly five million games. Several factors have contributed to this rapid data proliferation. Many Soviet games which had been unavailable in the West during the Cold War gradually trickled into the data pool during the 1990’s as that information became freely available. The growing popularity of ChessBase database software itself had an effect, as classic games from the 1800’s and 1900’s which were previously available only in print form were digitized and compiled into databases. But the biggest factor has obviously been the Internet. Chessplayers used to have to wait weeks or months for top tournament games to appear in publications like The Chess Player, Chess Informant, New in Chess, or Inside Chess. Now we’re able to download and replay games on a same-day basis or, at worst, wait until Monday night when The Week in Chess hits the Web. The ease and lower cost of electronic publication (compared to print publication) also means that games which might not otherwise be published (such as many master and IM tournaments) because of space concerns get out to the chessplaying public through electronic media. But there can be a slight downside to this data proliferation: when performing searches by player name, you need to be very careful when typing your search parameters. Some of these potential pitfalls are very well known: for example, most chessplayers are aware that two famous Laskers were contemporaries during chess’ “Golden Age” in the first part of the twentieth century: Emanuel Lasker and Edward Lasker. Consequently, a search for “Lasker,E” will provide mixed results combining the games of these two players; to narrow the search down to one player, we have to refine our search terms to “Lasker,Em” or “Lasker,Ed” (remembering to include the second letter of each first name). You might even be aware (especially if you’ve been reading my ChessBase articles over the years) that a search for “Karpov,A” also will yield similar mixed results, since you’ll gets games from both Anatoly and Alexander Karpov. I recently discovered a new mixed result (well, new to me anyway) involving a search for “Capablanca,J”. Using that search term will bring back not only the games of famous world champion Jose Raul Capablanca, but also those of a Brazilian player named Joanilton Capablanca. If you’re not aware of this second Capablanca, you might easily settle on a search for “Capablanca,J” and unwittingly get an extra (and unwanted) four games from the unrated Brazilian player. So how do we go about making a player search as foolproof a process as possible? As I’ve said many times before, the beauty of ChessBase 11 is that there is usually more than one way to perform a given task, and this case is no exception. By using a database’s player key you can be sure to the games of only the player you want without any accidental unwanted games caused by a partial duplication of names. You can scroll up and down this list to find just the player you’re looking for – but this “scrolling” procedure is practical only for small databases with few players. What go you do when you’re searching a huge database containing thousands of names? In this illustration, we can easily differentiate between Joanilton Capablanca’s games and those of the famous 1920’s world champion. We can also pick out Jose Raul Capablanca’s solo games and his consultation games (which are the ones listed with a slash and another player’s name following Capa’s). Clicking one of these buttons will truncate the game list so that it displays just the games in which the player had the selected color. The more letters you type in the “Search” box, the more specific the results will be. For example, if you type just a “C”, the game list will scroll automatically to the start of the names which begin with the letter C. If you type “Capa”, the list scrolls to the point shown in the illustration. If you select “Capac”, the list scrolls to a point at which the first listed name is “Capaccioli”. There are several other functions in the player key; we’ve discussed just the basic features here. Note that every once in a while you’ll may still come across two players who have exactly the same first and last names (in fact, one such pair is displayed in the second illustration from the start of this post). How do you differentiate between them in such a case? Notice that there are two players named “Oleg Gorbunov” on this list. 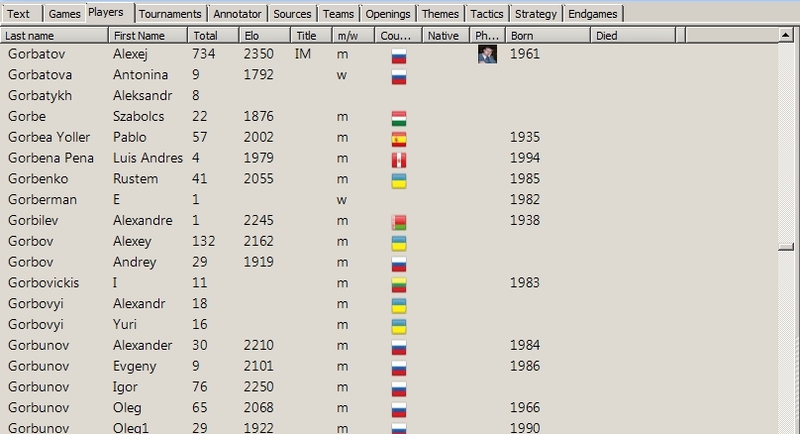 ChessBase has elected to differentiate between them by adding a “1” to the first name of one of the players. While this is helpful on the basis of data organization (the games of the two players don’t get “mixed”), that’s not terribly helpful to ChessBase users who need to be able to tell these players apart. So how do we do it? Note that there’s a fair bit of other information in this display. There are nationality flags for both players (which aren’t that useful in this case, since both players are from the same country). But we do see a couple of key pieces of data: birth dates and Elo ratings. The older Gorbunov has a higher Elo rating as well as more games in the database. This is the tournament display for the younger Gorbunov. The left-hand column lists the number of games which he played in each of the listed tournaments. The tournament information is provided for each event (name, location, date, FIDE Category, etc. ), so when all else fails you can sometimes differentiate between players using this tournament information (in this case, you might know going in that the Oleg Gorbunov in question was a player in a tournament in Donskoj [Donskoi] in 2003). Over the years, as the ChessBase software has advanced from version to version, the player key has also been improved. Once just an alphabetical player list, the player key is now a much more sophisticated tool which helps users to eliminate extraneous results to find just the information they want – and, after all, that’s what ChessBase 11 database software is all about.